ATP hosted a recruiting event at our Mesa-Gateway Flight Training Center in Phoenix recently. The event featured the new relationship between Allegiant Air, Ameriflight and ATP. ATP and Ameriflight have been close recruiting partners for over a decade and ATP has placed 49 pilots with Ameriflight just since 2012. Recently, Allegiant Air signed on to the partnership with an agreement that pilots from Ameriflight will now “flow through” to Allegiant Air. That agreement further defines the straight path that ATP Students take from the beginning of their flight training to flying for an airline. A student begins training with ATP and less than six months later becomes a flight-instructor with ATP to gain quality flight experience. ATP’s agreement with Ameriflight allows our Instructors to then begin flying for Ameriflight with 800 hours of flight experience instead of the 1500 hours required by the regional airlines. The ATP pilots then flies for Ameriflight while building valuable flying experience until they are qualified to fly with Allegiant at 1500 hours of flight time. Allegiant Air Chief Pilot, Jeff Panhas, and Ameriflight President, Andrew Lotter, visited the ATP facility at Mesa along with their recruiting teams to speak with ATP Instructors and students. Both airline executives made presentations to the assembled group of ATP pilots and then answered their specific questions about Ameriflight and Allegiant Air. 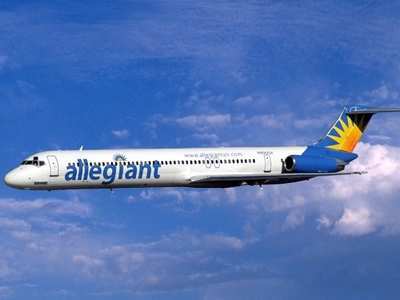 Allegiant Air is based in Las Vegas Nevada but has connections to the Mesa-Gateway airport that they share with ATP. Allegiant Air is the only carrier that services Phoenix through the Mesa-Gateway Airport. Ameriflight is headquartered in Dallas at the DFW Airport, and flies over 1700 departures weekly to destinations in 35 US states, Canada, Mexico and the Caribbean. When charting a career course in aviation, it is best to keep your destination in mind. If your career destination is the cockpit of an airliner, then the best place to start is the place that has the time-proven record of sending the most pilots, by far, to fly for the airlines. Get to your seat in an airliner ahead of your competition by flight training with ATP.